The Quality Hotel & Conference Centre is located in the heart of Niagara Falls only minutes from all the fun and excitement near the mighty Horseshoe Falls. This modern style Niagara Falls Quality Hotel offers guests 133 newly renovated hotel rooms, including 40 Jacuzzi suites, 12 fireplace and jacuzzi suites, and 32 guestrooms with a view of the beautiful courtyard. This 100% non-smoking hotel offers wonderful guest amenities such as an indoor and outdoor heated pool, whirlpool, free newspaper from Monday- Friday, wireless high speed internet, and free continental breakfast. This Niagara Falls Hotel also offers the ideal space for your next meeting. The meeting space available at the Quality Hotel & Conference Centre is ideal for a large wedding as well as an intimate gathering. The Quality Hotel & Conference Centre in Niagara Falls, Ontario is the perfect accommodation choice for your next Niagara Falls vacation. This Niagara Falls hotel accommodates any type of traveler, whether it be business related or family oriented. Completely renovated in 2007, the guest rooms and suites of this modern Quality Hotel provide guests with the best amenities. Also offered at the Quality Hotel Niagara Falls are many amenities including free continental breakfast, free wireless internet, free local weekday newspapers, and free local telephone calls. Guests can also enjoy the indoor and outdoor swimming pools, and an indoor whirlpool, or a scenic walk on through the courtyard. 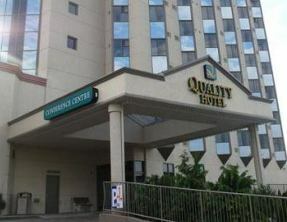 The Quality Hotel & Conference Centre also provides guests with a perfect location for your next Niagara Falls meeting. The Quality Hotel & Conference Centre is the ideal location for your next Meeting, wedding, or conference in Niagara Falls Ontario. The Quality Hotel Niagara Falls has a delicious buffet or dinner menu available. Also They have on site sales representatives to help you plan the perfect event. This Niagara Falls Hotel has been home for events such as, civic groups, families, corporate events, social clubs, athletic organizations, and political parties.